Can't help think it would have been better if you had caught the birds eye instead of it being hidden. Still a fantastic effort! Excellent capture. 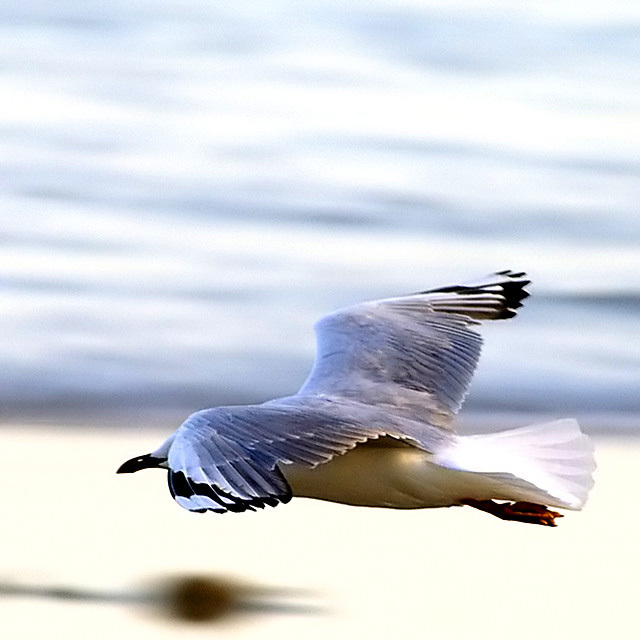 Background offers the feel of motion, nice colors in bird. To me the slight blurring on bird in some areas adds to motion. The strange shadow is a bit distracting, but is no fault of yours. Overall excellent!! Lovely shot! The colors, contrast, composition are all virtually perfect. There are a few post processing artifacts but none so severe that they would bother me much. The degree of difficulty of this shot, plus it's excellence make it a top entry in my book. Neat capture. My eyes however, keep getting drawn down to the blurred brown spot along the bottom, thus losing my attention from the bird itself. Wish I could see his eye. Not a professional model guess. The wings alone are impressive. Strength and beauty nice color too. the blurr really compliments the sharpness of the bird. good job! Nice trailing edge line and feathers, interesting shadow, and soft bokeh. Too bad the eye is hidden. Very interesting. I thought the title should not use the assignment word. But this is very appropriate. DOF could be a little more. What is below the bird? Doesn't seem to add anything. I am sure it took time to get this photo so I am not being critical. To bad you could not get a little more of the head. Good luck. A captivating in your face image. Cool. Very nice. If you could have gotten the eyes in the shot I probably could have gone with a 10....But still a very nice capture and one of my best! Proudly hosted by Sargasso Networks. Current Server Time: 04/24/2019 03:52:44 AM EDT.